Terrine, the word itself sounds so sophisticated – t e r r i n e , and yet it’s just food baked in an earthenware mold. 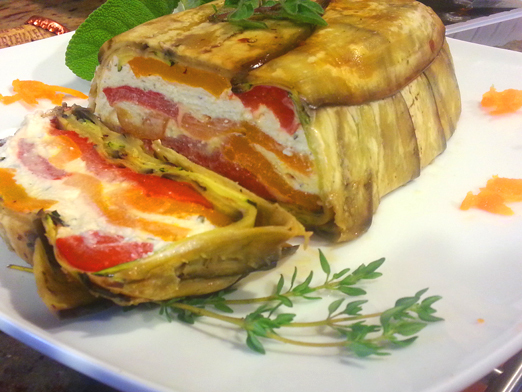 There are meat terrines, poultry terrines, fish and seafood terrines and of course vegetable terrines. What I like about making them, is that it allows for your imagination to run wild, and create beautiful and delicious food. This particular terrine serves 6 as an appetizer. The ingredient list has approximate measurements. 2. 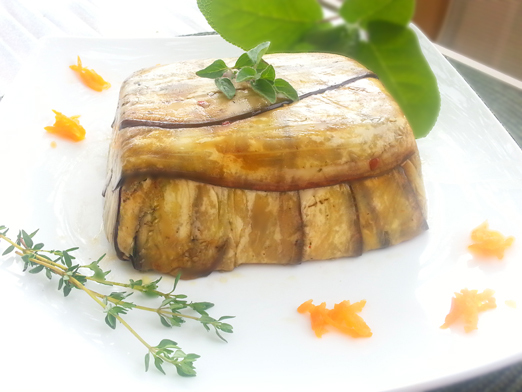 Sprinkle Eggplant and Zucchini slices with salt and leave for 15 minutes in order to draw the bitter taste out, and to help absorb the marinade. 3. 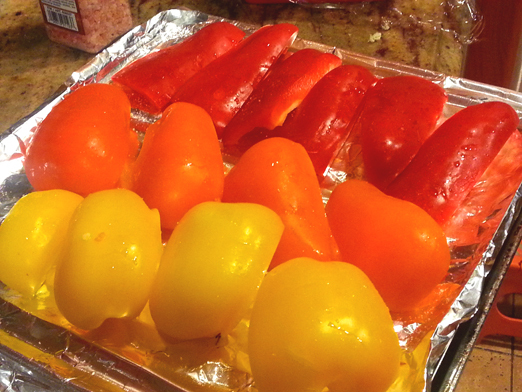 Meanwhile cut the peppers into strips and lay them in a roasting pan skin side up. Broil on high until skin blisters. 4. Rinse eggplant and zucchini, dry each strip. Sprinkle with oil, salt and pepper and half of the herbs and broil just until soft and start to color, about 5 minutes. Be careful not to burn them. 5. Mix cheeses, garlic, salt and pepper and the rest of the herbs in a bowl. 6. Line a terrine dish with plastic wrap so that it has a hefty overhang. 7. Cover the sides and bottom of the dish with eggplant so that the strips overlap and overhang enough to cover the dish on top. 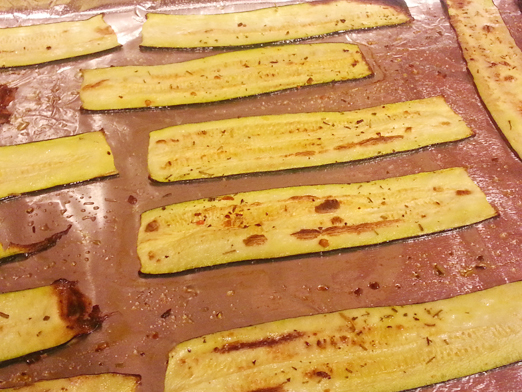 Add a layer of zucchini strips in the same way. 8. Add a layer of peppers to the bottom of the dish. Layer the peppers with cheese. Repeat until the dish is filled to the top. 9. 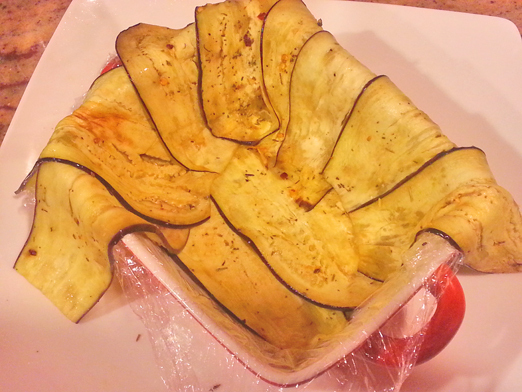 Cover the pepper and cheese layers with overlapped zucchini, then eggplant, and finally plastic wrap. 10. Add a press on top. Refrigerate for at least 3 hours. 11. Remove the plastic from top of terrine, invert the dish onto a serving platter and lift the dish off the terrine. Remove plastic. I tried this and it is one of the best things I have ever eaten!!! You need your own show on the food network.